A large earthquake several hundred kilometers offshore Japan triggered a tsunami warning and a subsequent small tsunami, in the early morning hours of Nov. 15. No major damage has been reported, and although the region is highly seismically active, the earthquake itself was slightly unusual, according to U.S. Geological Survey (USGS) scientists. Centered about 350 kilometers (215 miles) to the east of the city of Sendai, on the eastern shore of the island of Honshu, the earthquake occurred at 7:38 a.m. local time. The magnitude was around 6.9 or 7.0, according to the USGS National Earthquake Information Center (NEIC) in Golden, Colo., and the Harvard Centroid-Moment-Tensor (CMT) project, in Cambridge, Mass. The largest tsunami waves triggered were about 50 centimeters high, or about a foot and a half tall, according to Ross Stein, a seismologist at USGS in Menlo Park, Calif.
Major earthquakes that have occurred offshore Honshu, Japan, since 1900 tend to have been centered below the Japanese plate, unlike yesterday's earthquake, marked by the central star, which occurred east of the fault that marks the boundary between the Japanese plate and the Pacific plate diving beneath it. Courtesy of USGS NEIC. The earthquake occurred where the Pacific plate, which is moving west, dives beneath Japan at a rate of about 8 centimeters a year. Usually, the Pacific plate tends to make the Japanese plate jump up vertically during earthquakes, which tend to be centered on the Japan side of the subduction fault where the two plates meet. 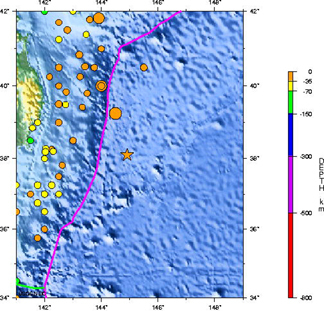 Both NEIC and the Harvard CMT scientists found that the earthquake was caused instead by the Japanese plate dropping down relative to the Pacific plate, Stein says, making the current earthquake "unusual." Stuart Sipkin, a seismologist at NEIC, was less surprised by the movement during the earthquake than he was by the location of its epicenter, which was farther east (and farther seaward) of the trench "than we're used to seeing for this area." Its position relative to the majority of earthquakes on this subduction fault is "not totally abnormal," but not expected either, he says. Vertical plate jumps, either up or down (though usually up), can create tsunamis. Still, this tsunami turned out to be "nothing to get excited about," Sipkin says. Still, "ever since last December, everybody is very tsunami-conscious," he says. "Any earthquake large enough to generate a tsunami is generating a lot of public interest  that dissipates as soon as it's evident it didn't generate a tsunami." Japan is no stranger to tsunamis. Around 90 percent of all tsunamis occur in the Pacific, and historians have tracked such events in Japan's written records for hundreds of years. "Japan is so vulnerable and has suffered so much damage," Stein says, that "it's not an accident that [tsunami] is a Japanese word." Japan has invested tens of millions of dollars annually in its earthquake research programs, which, among other results, have led to an online real-time tsunami warning system that was activated for this most recent earthquake. Several hundred homes were ordered to evacuate briefly, according to Agence France-Presse. Eric Geist of USGS in Menlo Park, Calif., says that yesterday's event occurred in the vicinity of a 1933 earthquake, nicknamed Sanriku, which killed several thousand people: It was far offshore and created a tsunami that was 29 meters at one place. The town of Ofunatu, which had a wave of 30 centimeters yesterday, experienced a 3.6-meter wave in 1933. That earthquake was magnitude 8.4, much larger than yesterday's event. Because both events took place in deep water, he says, the tsunamis they triggered get "amplified by the time it gets to shore." Historically, around three or four large events, around magnitude 8, have occurred on this subduction fault over the past several centuries, as the Pacific plate slowly presses westward under Japan. A magnitude-7 earthquake is not large enough to relieve all the stress of the Pacific plate's movement, so, Stein says, a very slight possibility (around 5 percent) exists that an even larger earthquake could follow yesterday's event.